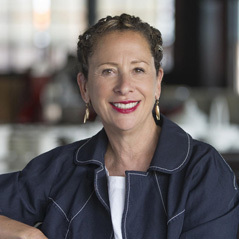 Nancy Silverton is the co-owner of Pizzeria and Osteria Mozza in LA, Newport Beach and Singapore, as well as Mozza2Go and Chi Spacca in LA. She also founded the world-renowned La Brea Bakery and Campanile Restaurant, an institution that Angelenos cherished for decades. Nancy has worked with some of the nation’s most notable chefs including in the kitchens of Jonathan Waxman at Michael’s Restaurant and Wolfgang Puck at Spago. Additionally, she has served as a mentor to numerous others who have gone on to become award-winning chefs and restaurant owners themselves. In 1990, Nancy was named one of Food and Wine Magazine’s “Best New Chefs.” Also that year, she was named “Pastry Chef of the Year” and “Who’s Who of Cooking” by the James Beard Foundation. In 2014, she received the highest honor given by the James Beard Foundation for “Outstanding Chef” as well as listed as one of the Most Innovative Women in Food and Drink by Fortune and Food and Wine Magazine. In early 2015, Nancy launched Nancy's Fancy, a line of premium gelato and sorbetto which is sold in supermarkets nationwide. Nancy Silverton has an amazing capacity for embracing the beauty of wonderful food, and will undoubtedly continue to do so for the rest of her ingredient inspired life.